In a way, one car is pretty much like another— an amalgam of metal, glass, fabric, and rubber. Each model of car is, of course, different in style and engineering, special from others. But for me, by far the most interesting part of any individual car is its history: where it’s been, who used it, and the stories that they might tell. What you are looking at below is a very rare moment in time and an important part of my life as a restorer. A time when both the Roadster SLS Prototype #1 Chassis 8427198118/1 and Gullwing Prototype 1955 World Rally Championship car Chassis 8627198071/7 were both with me at my shop in Michigan in the mid 1990’s. Of all the Mercedes-Benz models produced, the pinnacle remains to this day the 300SL, Gullwing and Roadster. Both the cars discussed here are Scott Grundfor Company restorations that have been shown publicly at Pebble Beach (and other prestigious events) and both have such history that they remain without doubt 2 of the most significant 300sl’s in existence. Both cars exist in private collections today, the SLS Roadster in Italy and the Prototype Gullwing here in California. The original steering wheels of both the SLS Prototype Roadster and the Werner Engel Prototype Gullwing. Otherwise mildly unremarkable, these steering components were attached to the original cars that helped spark the 300SL legend. 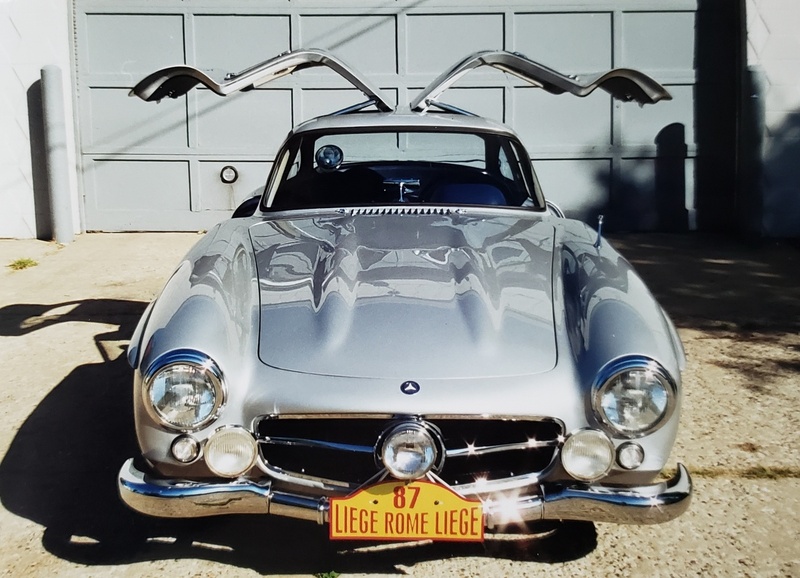 This 300SL Gullwing Prototype, chassis 8627198071/7, is the car that Werner Engel drove to the 1955 World Rally Championship. Undoubtedly one of the most important Mercedes race cars in existence. Built alongside the W196R Grand Prix and the W196S SLR race cars, its chassis number, beginning with the code 8627, ties it to the racing department. The W196 racers that won the World Sports Car and Formula One Championship in 1955 share the same 8627 designation. This particular Gullwing is one of the most difficult restorations I have ever attempted. The most obvious difficulty was the car’s condition, but it would be difficult to unlock its past. When it arrived at our shop, the car was assembled and running, but unfortunately it had suffered the cumulative effects of long, hard use. I feel strongly that any restorer must try to save as much of an original car as possible, especially if the car may be historically significant. We made every effort to repair many damaged pieces that for the sake of economy probably should have been re-created or replaced. Which of its three versions should this 300SL be configured as? Should it be to its first form, the prototype coupe with the push-button doors? The decision was made to restore it as the 1955 works racer, which was essentially what we had minus the rally equipment. During my research I found a series of wonderful photographs by Kurt Worner. Made for Road & Track during the 1955 Liege-Rome-Liege Rally, they showed Werner Engel and the car with co-driver and mechanic Roger Staub, who was on loan to him along with the car from DBAG. The license number in the photographs helped identify the car in other photographs, and little by little we pieced together its history. In the vendor area at the 1999 Monterey historic races, I was looking through a tent that had rally plates hanging from a rope strung between the tent poles. 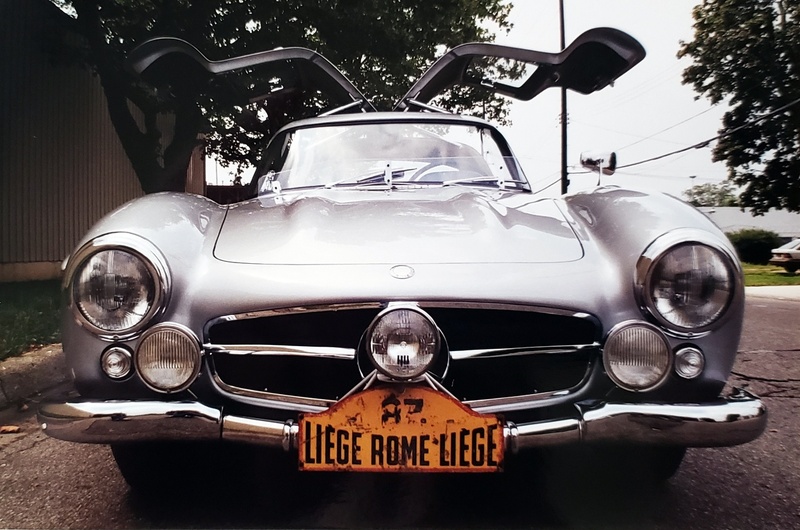 Two original 1955 Liege-Rome-Liege Rally plates caught my attention, and I almost fell over when I realized that one was the actual number 87 plate from Engel’s 300SL! After haggling with the vendor, I bought the plate and reunited it with the car. Werner Engel and the car with co-driver and mechanic Roger Staub, who was on loan to him along with the car from DBAG. Trophies in tow for the 1955 World Rally Championship. Nitske’s research revealed that the SLS was originally 300SL chassis 00009/52. Part of the firm’s anticipated ’52 competition programme, it was homologated in Germany on May 26 with number 101977 and license W 83-3786. It was then a gullwing-doored coupé. Unusual parts uncovered during the strip down backed this up, such as the magnesium intake manifold and sump. They also found the disc brakes from the 1956-’57 test sessions. As they toiled away, the SLS caught the eye of Naohiro Ishikawa, so much so that the Japanese collector bought the car. It then made its debut at the Monterey Historics/Pebble Beach weekend in 1991. Six years later the unique Merc returned to Pebble, then owned by Bob Meyer of southern California. The car was still in immaculate condition, so Grundfor gave it a good detailing. The SLS won its class. During this appearance at Pebble Beach, an episode occurred that shows Duncan’s Secret SLS title was still applicable. A senior Mercedes executive walked around the fabulous roadster, with a quizzical look on his face. He finally paused, then shook his head and muttered: “We never built that car!” Rather than being viewed as a comment on its authenticity, this observation is amusing because a few years earlier the factory museum had published a catalogue featuring the SLS, stating that it was the 300SL prototype. Seven pages were devoted to it, lavishly illustrated with Duncan’s breathtaking photography. Today it looks as if it might have driven straight out of those photos. It may appear similar to the production 300SL Roadsters, but every body panel is different, more voluptuous, sensual and taut.